Some of the remains of the Brewster-Douglass Housing Projects in Detroit. These buildings were completed in the 1950s and finally officially closed in 2008. The facade of an abandoned bank covered in graffiti. 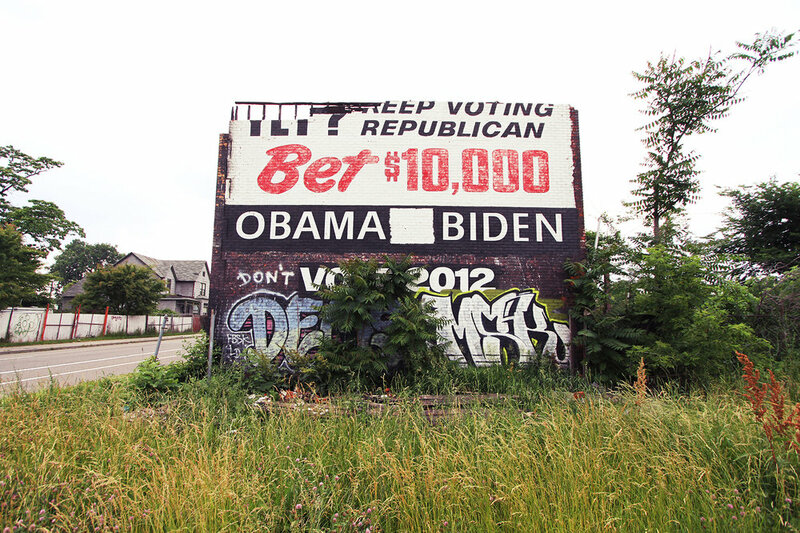 A political message for the 2012 presidential election on the side of an abandoned home in Detroit. Photograph of what remains The Packard Automotive Plant in Detroit. This large space was used to create Luxury cars. Opened in 1903, it has been in use in one way or another until the early 2000s. An abandoned auto-body garage in Detroit. Various sections of wall have been removed. Probably so scrapers could enter and obtain any materials of re-sale value. 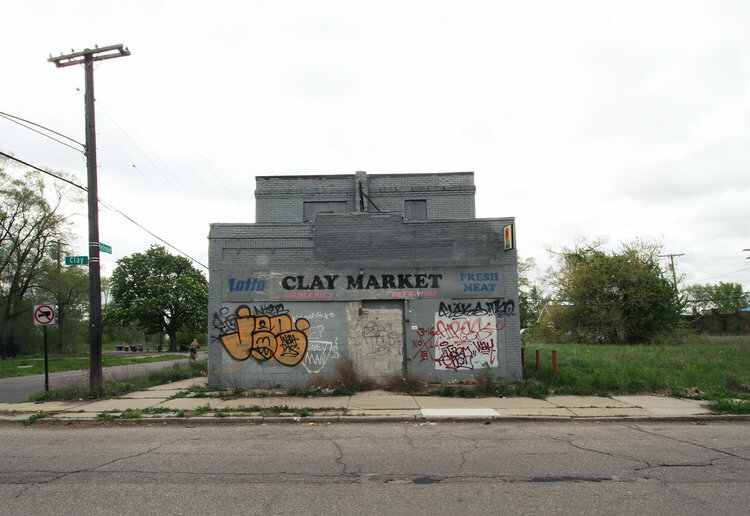 A graffiti covered storefront in Detroit. We’d pass through many stretches of blocks with all of the stores/homes boarded up. A makeshift home under one of the many overpasses in Detroit. A quiet street scene in Detroit. One of the most jarring things we noticed while we were there was the lack of people in most areas. Some intersections that you would assume to be busy and active, were very quiet & surreal. 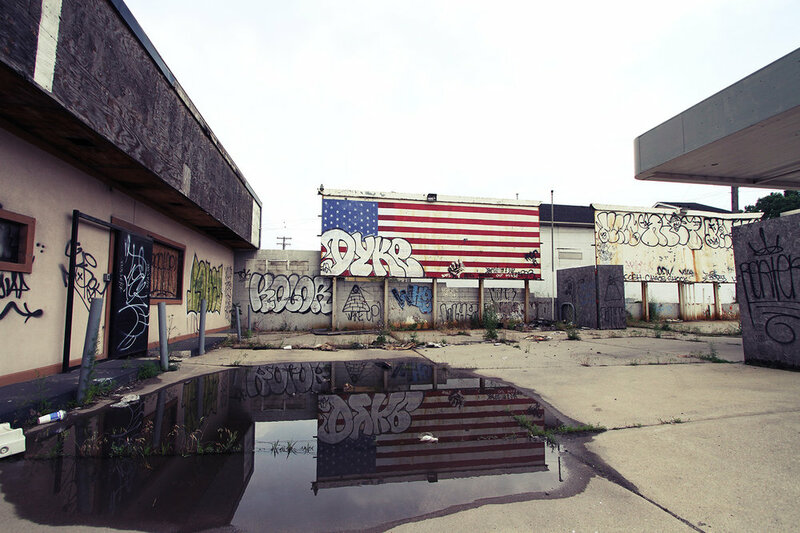 Graffiti on top of an American flag painting found at an abandoned gas station in Detroit. Empty school hallways in an abandoned catholic school. Remains of a burned down house in Detroit, MI. While we were staying in town, the sound of fire trucks could be heard almost nightly as arson was one of the most prevalent crimes committed. It was not uncommon to see at least a few charred remains on every block. Graffiti on the front of an abandoned church & parking garage in Detroit. Graffiti on the facade of a local church in Detroit. Unfortunately, many churches were closed during this time period. Remains of an abandoned convenience/liquor store in Detroit. A dimly lit portion of an abandoned auto-factory in Detroit. Religious passages mixed in with graffiti tagging on the walls of two shuttered places of worship in Detroit. Remains from one of the outer buildings of The Packard Plant in Detroit. It appears to have been used as a location for a party or as an artist work space. The strange feet/legs hanging from the ceiling definitely gave this place a weird vibe. An abandoned local shop on the street in Detroit. 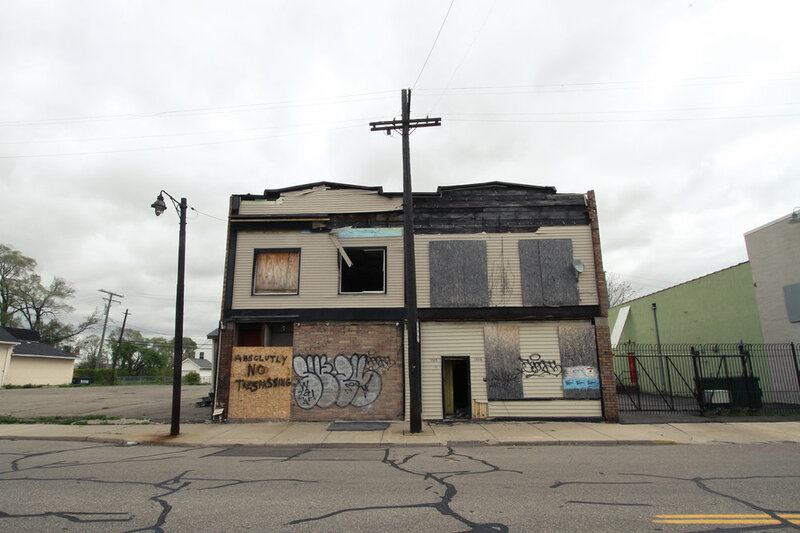 Boarded up local stores in Detroit. 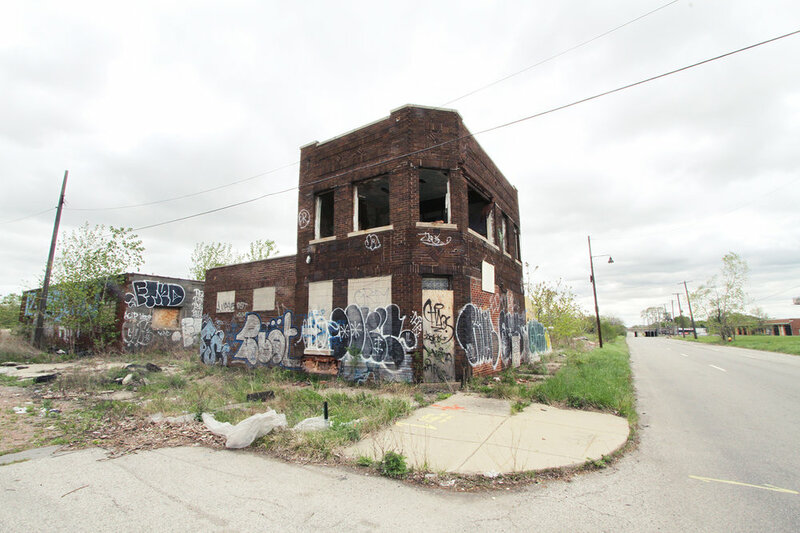 An abandoned building covered in graffiti located in Detroit. An interesting looking building covered in graffiti in Detroit.